Steve Squyres is the lead scientist on the Mars Exploration Rover Project - Spirit and Opportunity - and Miles' guest for the hour tonight at 7pm Eastern. I just finished having lunch with a bunch of my friends from the Phoenix team. I'm frankly amazed that they¹re relaxed enough to eat, but in fact a sense of calm seems to have come over most of them. At this point, they've done everything they can do. The final computer instructions are now onboard their spacecraft, they've got Mars squarely in their sights, and from here on out it's in the hands of fate. Thing is, with Mars so far away from Earth, it takes about sixteen minutes for a radio signal traveling at the speed of light to get from one planet to the other. In contrast to that, it only takes seven minutes from when Phoenix hits the top of the Martian atmosphere to when it's safely on the surface. So from now until landing, the Phoenix team members are spectators, just like the rest of us... except they have better seats! In comparison, how relaxed was the MER team in the hours preceding the MER landings? Have you looked at any of the HiRise images to search for MPL? What effect would the thrusters have on any near surface H2O-ice / fine material layers during the final moments of landing? Over how large an area relative to that of Phoenix? What caused the sister spaceship to crash on landing and what was done to assure the same problem does not happen this time ? Hi Steve, glad for this project.....I'm a woman of faith and my good book tells me God made the heavens and the earth and all that is in it. I am praying for the safe landing, for life to be discovered (no matter how minute)..it's only a confirmation of all the wonder of God in science. God's speed to your project! 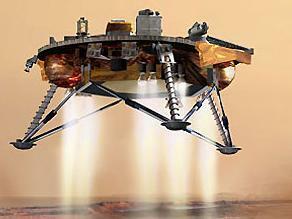 I have followed Mars landings since Pathfinder and it's really exciting stuff. I wish the Phoenix Team all the best in their endeavor to try and uncover the secrets of the Martian polar region. I'll be waiting anxiously for the first images following a successful landing! Remember Genesis space capsule's unsuccessful mission when the parachute failed to deploy? I hope that it will not occur to Phoenix's mission. Great to see there is so much interest in space again from CNN's coverage to Science Channel's live coverage. Nothing better than bringing space to the people as NASA celebrates 50 years. Why is it we could place two landers on the surface of mars in the 1970's but now it's such a difficult process? Secondly why not use a rover on the polar caps? It seems like using a lander really limits what you can do. Thank you, thank you, thank you to CNN for their coverage of this incredible event. And to Miles O'Brien for his expertise. My local cable company took away NASA TV from our channel lineup several months ago.... I thought I would have to miss live coverage, but thanks to CNN, we all get to share in what will hopefully be a great moment. This is a wasteful project for NASA. 422 million miles of travel, with a 50/50 success rate. This money should be used for other things like the planet we currently live on that's called "Earth". I am not an eco-freak or green peace activist etc. This is tax payers $$ at work, correct? Why not let private firms finance these outlandish projects. 3 questions: How significant is the landing site's local weather in measuring the success probablitities of the a soft landing? If weather on Mars often includes possible wind speeds of 80 mph or more what happens to the Phoenix if it flies through or lands in an area of high winds? And finally, is it possible yet for us to measure and forecast wind speeds from an orbiter? Our team there at JPL have been doing a wondelful job of carrying our country's spirit of inquiry and exploration to another planet in our solar system[Mars]. I am joining you in faithfully expecting that we will discover many new insights, as a result of your hard work, into who we are as living parts of a very good, very well supported and protected, and very well thought out huge cosmic plan of human life. Our team there at JPL have been doing a wondelful job for some time now of carrying our country's spirit of inquiry and exploration to another planet in our solar system[Mars]. As I write this I am joining you there in faithfully expecting that we will discover many new insights, as a result of your hard work. I expect we will lean much about who we are as living being/ individual participating parts of a very well supported and protected, very good, and very well thought out huge cosmic plan of human life. Frankie M. what would you spend money on toward "Earth"? Good! The rover landed! I can't wait to tell my grandchildren in a few years that their grandpa was watching the T.V. when Mars' first landing happened! I'm so happy for the team! Good for them! Excellent job guys! I share your excitement. Thank you for sharing your work interactively. Looking forward the discoveries ahead. WOO-HOO! Way to go Phoenix!! I'll be glued to my computer screen when those photos and data start coming in. Congratulations to JPL/NASA on this accomplishment. I am proud to be an American and fully support these endeavors. why, oh why are people commenting on such on such a groundbreaking event with stupid comments about the whole thing being a waste of time and money? This is what NASA does. They open up the universe to us. They get a small endowment from the government compared to other programs that would be considered "porkbelly,"
I only wish you as a scientist would acknowledge God in all this...because we followers just prayed for the safe landing on Mars..it is to God's benifit that you discover all that he has formed, made in this beautiful universe. Congratulations on a successful landing! I was just wondering who you all got NASA to ever agree to the name Phoenix. NASA has had a long, long history of always vetoing the use of that name. For example, Phoenix was the #1 name for OV-105, but NASA pushed that choice away, and went with Endeavour instead. Congratulations on an amazing accomplishment. Can't wait for the pictures. Frankie M, why would a private company want to finance something like this? What is the payoff they would expect? (and how likely is it they would be successful)? nice job on the landing! Congratulations on a successful landing! Now the real work starts! I was stunned that after the capsule landed your coverage stopped abruptly with no indication that you would resume. Instead you switched to another program. Great coverage with a very disappointing conclusion.This was very badly handled. Awesome job. . .the next step toward a space station on Mars!! Chill out "S. Callahan"... make ya a deal... if I see a long-haired dude in a flowing white robe standing there in the first pics from the Phoenix on Mars tonight... I'll buy a bible and read up on the dude. Until then... umm... keep on keepin' on! Scientists must have gained enough knowledge by now as to in how many varied conditions LIFE occurs to say that we are not alone in the Universe. What a great waste of Space! Watching the video feed from the floor at NASA, I was just wondering what are the uniforms all about? Everyone was wearing a blue shirt and khaki pants. And American flags were the decor....what was that all about. Made me feel I was watching Orwell's 1984. You made us proud on Memorial Day weekend. HOOAH! Great work! Congratulations to the amazing engineers of the NASA team! What would I spend the money $$ on, on Earth? You are asking the question either as a sarcastic remark or you are curious as to my answer. First off, affordable health care in the US or "fast paced" technology that will actually limit our use of oil which is causing a chain reaction in the US economy, to name just a few. How does this Mars project benefit us now or in 100 years, it doesn't and that's when the Earth will be most vulnerable. When I was born, jet engines were just beginning to be developed. There was only about 2 billion people on the planet, television had not yet been invented, and many people believed the earth was flat and that it was impossible to travel even as far as the moon. It's been an interesting life so far. Congratulations, guys. I hope everything continues to go well. Has it ever been considered their was intelligent life on Mars, aware of the global warming of the planet that would cause their extinction, and in an effort to survive they sent single cell life forms to earth containing their DNA? Really glad you liked the hour; Here's why coverage ended abruptly after the successful landing: Phoenix communicates via a relay with three orbiting satellites - two belonging to NASA and one to the European Space Agency. As part of the plan, Phoenix went into radio silence just one minute after the landing. In short, by the structure of the mission, we would have pretty much have nothing to say for quite a while. After communication is re-established, we hope to get the first images from Mars just before 10pm ET, and Miles will be on CNN to share them with you then. Frank M must be an Obama man. Stop eating and start walking! If a private/public business were doing this for exposure / publicity, it sure wouldn't be free. After all, wouldn't they be funding the mission? Would a soft drink company might sponsor a mission to Mars in return for the brand exposure? It seems to me if their goal is publicity or exposure, there are much more cost-effective ways to get that. Besides, what company would want their product associated with the mission, should it fail? Maybe you weren't talking about sponsorship, but investment for profit from space activities? Maybe if we found oil or other resources and could bring them back here in a cost effective / profitable manner, that would change things. Right now, the technology isn't ready. The cost and time needed to develop that technology is large, and there's a good chance it will never bear fruit. The technology not only has to work, but it has to be dependable and cost-effective to use. Also, any such resources would have to be plentiful enough and close enough to be economically viable. Given the high costs, the long payoff cycle, and the high risk of no payoff at all, why would any private company take this on? The problem is, at this point it's very difficult to do anything profitable involving space exploration, and that makes this sort of mission unattractive to a private venture. That's not to say private industry has no involvement - NASA definitely works with private contractors to develop critical mission components (e.g. robot arm, rocket engines, etc). William – the short answer is yes. The concept that earth was – and is still being – seeded from space is not a new idea, and in fact the concept can be found even in ancient religions, mythology, scifi, and in serious scientific circles. Whether Mars was noted as the origin or not is kind of beside the point. In any case, I doubt that global Martian warming would have been a factor. Great job indeed. Keep it up. I do learn a lot from your outfit. Once again kudos!!!! Lets have more pictures as done Spirit and Opportunity. D Runyon, I'm an Obama man, and proud of it. But that doesn't mean I agree with Frank M, I don't. I've heard naysayers, like Frank M, all my life. This type of thinking will pass in time as we learn and gain from these adventures. Don't let him/her get to you. What a great moment in space exploration. Congratulations to everyone involved.one day we will see travel agency saling tickets to the outer space ...ohh is there oil in there ??!! Congratulation on a Mission well done, as a scientist I appreciate the feeling of success. Exploration of the moon and mars should be view as an understanding of the earth's origins and a step towards our future however far off this might be. Frankie M has no idea of the amount of money spent on research (medical, energy, communications, etc.) with no positive results . His discontent should be pointed toward the enormous amount of money spent on a war based on lies and incompentence . That amount of money WOULD have made the difference in health care in the US and hunger in the rest of the world. How many do you want to bet that NASA is NOT going to find any life on Mars? How do I know? Their probe landed on the surface while simultaneously sterilizing the ground around the probe with its 10 super-hot rocket thrusters as it “soft-landed” on the surface. Any life, microscopic or otherwise, was instantly killed under this brain fart of scam. Why change the way of landing on the surface when the beachball method worked out so well before? First off, I am not an Obama man, or an eco-freak etc. I am talking reality. Secondly, I don't agree with the War in Iraq or the 100 billion spent on it and I am well aware of the amount of $$ spent on research. So please, by all means, stop assuming. Why does Richard Bransen, the owner of Virgin Atlantic Airways fund space projects? Think about it, for one he has the $$ to do it, and 2 it puts Virgin Atlantic airways mentioned on EVERY newscast when something affiliated with his projects hits the news=Free advertising. Give me an estimate of when u think today's project will reap benefits for the human race? The ultimate goal is to see if life exists on Mars, correct? The ultimate goal is to see if Mars can be inhabitable? 1,000 years from now? When? What is being gained and when will people see the benefits? it is useless to talk to people like you but I will try 1 more time. 1 earth,6 billon+ people and growing,if not space just where do you think we will get the resources to keep them all alive? I find it hard to believe that so many people think this is a wonderful project. I find it just a very expensive "boy toy". What a waste of money. Think of all it could be spent on. Medicare problems solved, Medicaid, Taking care of our wounded military people. Solving the globing warming problems. All the damage done by Hurricanes, Tornadoes, Earthquakes, and Mlitary protection. The list is unending! If you have to get excited about a handful of dirt and maybe ice crystals on Mars or any other planet, it should be funded completely by private business! I don't want my taxes wasted on it!! Congratulations to all of NASA. Science and space must be supported and only governments can do that because the benefits can't be measured imediately. Thank goodness the caveman experimented.....and explored over their horizons.... if they hadn't ..... well ...it would have been a different world today. Steven Squires...... I would still love you to try and do my small art project on the surface of mars with one of the rovers. A small wiggly line going into a circle.... an egg being fertilzed....I know you could do it.... you have performed miricles already. Find a way. Art going from cave walls to the surface of another planet. I challenge you to at least try it. Он даже стены не мог видеть». ICQ объявляет войну «сервисам-подражателям»?На сайте qip. http://mobile-client.ru/jimm-2010.html – jimm 2010 Ваш язык, ваша музыка, обычаи, традиции, одежда. netСкачать ICQ Jimm 2009 + ICQ Jimm Xattab b [русские – от depositfiles. Индивидуалки троицкавидеодомофон постеры девушек скачать бесплатные утилиты гарем девушка любэ бесплатно стопа девушки переломана! бесплатные картинки 176х220 www лена беркова порно ru формы организации досуга молодежи видео драйвер sis650 дамашние фото порно еротика игры бесплатно siemens cx65 камеральная проверка курсовая бесплатно. Ослик. http://all-job.co.cc/rabota-v-nvrsk-v-novorossiyske.html – работа в nvrsk в новороссийске Вторая, позволяет привязать к любому физическому объекту весь возможный объем информации о нем. Теперь если вернуться к сайтам, предлагающим скачать видео. Первой такой сетью была ARPAnet, объединившая три сети в Калифорнии с сетью в штате Юта по набору правил, названных Интернет-протоколом (Internet Protocol или, сокращенно, IP). Толковать о пользе или вреде данных web-ресурсов adult тематики нет необходимости, т. http://job-vsem.co.cc/rabotodateley-v-cherepovce.html – работодателей в череповце А в-третьих, можно уединиться с девушкой-моделью в приватной комнате и шалить сколько вам захочется и как захочется. Все это абсолютно точно есть в таких журналах как: Penthouse.